Ahhh! Gardening. Hard work but so rewarding. I dropped by the Community Garden today on my way home from work and did a little weeding and watering. It was quite hot outside and my arms began to get a wee bit pink by the time I was finished. Just in time! Everything is growing beautifully. 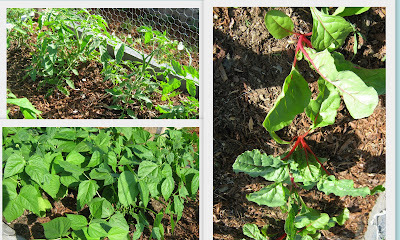 I can't wait until I can have my first (and perhaps only) meal of Swiss chard. .
My beautiful flowers are thriving despite the fact that there's been little weeding done. But I was diligent in picking off and squishing those dreaded Asian Lily Beetles and have managed to stay ahead of them. My lilies are gorgeous right now. The whole garden is gorgeous; I think it's at its prime! And, of course, it's Friday .... so I'm going to visit Tootsie at Tootsie Time and see what's growing in her garden and the other linkies. (As soon as Tootsie gets her linky up and running, that is). Gardens are a lot of work but very rewarding. I check every day to see what's cookin. Tomatoes are just starting to form. I have a yellow rose bush that has more blooms this year than all the other years put together. Happy Friday to you! It's finally been a lovely sunny week here and we've been rain free for a change. Maybe now I can catch up on some of the weeding you mentioned. 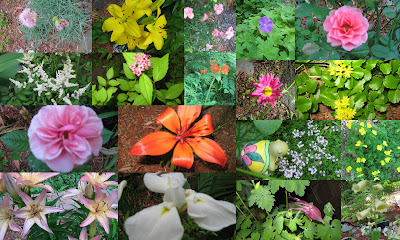 I don't have a vegetable garden but have lots of flowers. Our lilies are doing well here too. So far I haven't seen any of those beetles. I hope your day is a fantastic one! Lilies never last long enough...they seem to come on...get all gorgeous...and fade right away! I wish they re-bloomed..all summer long! 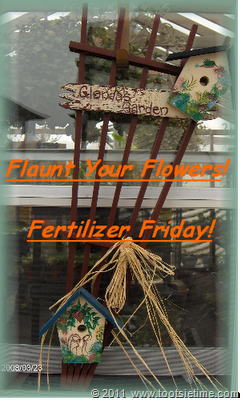 your flaunt this week was wonderful...love that you help in a community garden...enjoy the swiss chard! thank you for linking in and flaunting with me this week...I do hope to see you here flaunting again soon!!! I hope you have a great weekend friend...I enjoyed the visit here today! beautiful flowers and so nice that you take the time to work in the community garden. You're got some really beautiful things blooming right now, Sandy! Is it just me, or do lilies look good enough to eat to you too?! Bless you for growing in a community garden! I've wanted to do that for years now, since I gave up my space for a water feature. Happy gardening! What a bevy of beauty you are flaunting this week. I'm just stopping in from FF and was amazed at your blooms. I wish I had the time and energy to work in a community garden, what a wonderful thing for everyone involved. What a wonderful way to make the world a better place!